Preheat the oven to 375°. Butter a 9-by-13-inch baking dish. On a large rimmed baking sheet, toss the sausage, onions and oil and season with salt and black pepper. Roast for about 20 minutes, until browned and softened. 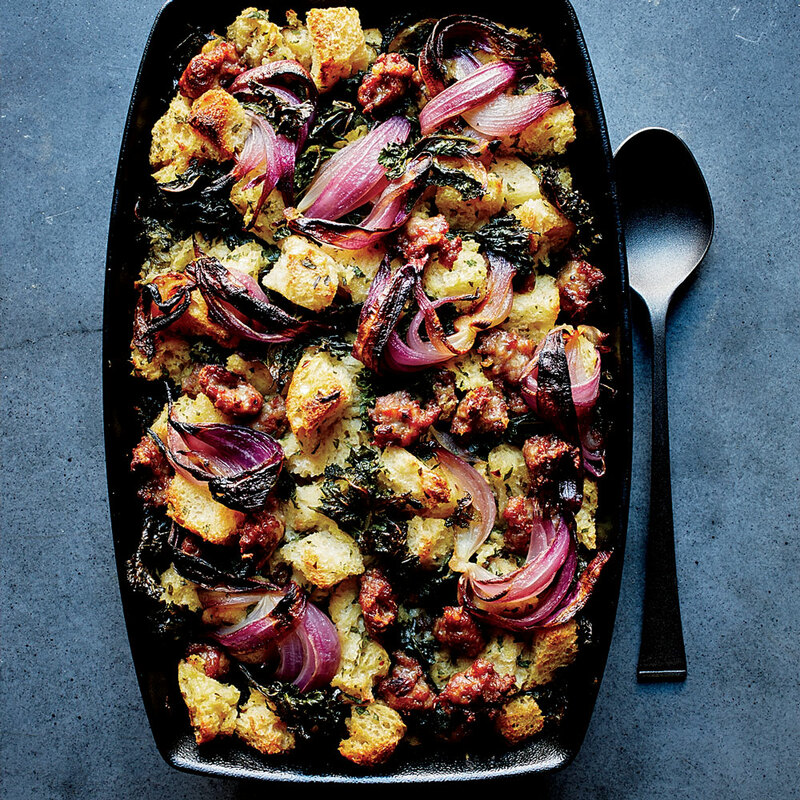 Scatter the kale on top of the sausage and onions and roast for about 5 minutes, until just wilted. Transfer one-fourth of the mixture to a plate and reserve. Let cool slightly. In a large bowl, beat the eggs with the chicken stock. Add the bread, the 1/2 stick of butter, the parsley, thyme, crushed red pepper, 1 1/2 teaspoons of salt and 1 teaspoon of black pepper; mix well. Fold in the three-fourths of sausage-kale mixture, then scrape into the prepared baking dish. Decoratively scatter the reserved sausage-kale mixture on top, gently pressing it into the stuffing. Cover the baking dish tightly with foil. Bake the stuffing for 30 minutes, until hot. Uncover and bake 30 minutes longer, until lightly browned. Let stand for 10 minutes before serving. The recipe can be prepared through Step 2 and refrigerated overnight. Bring to room temperature before baking.